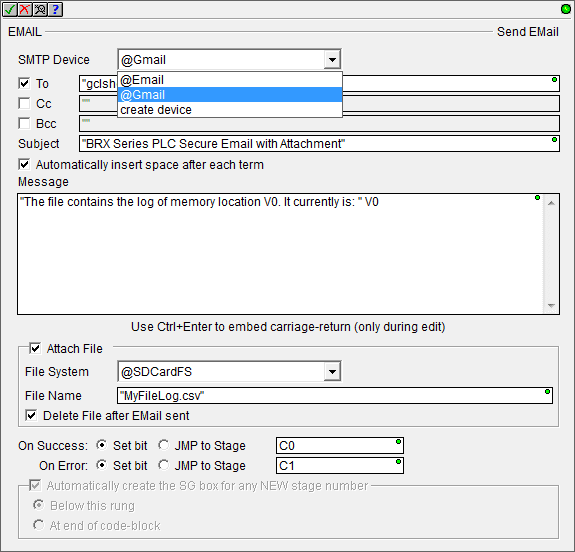 The BRX Series PLC also has this Email capability along with attaching files. We will also be looking at secure email services with the BRX Series PLC. Let’s get started. 1. 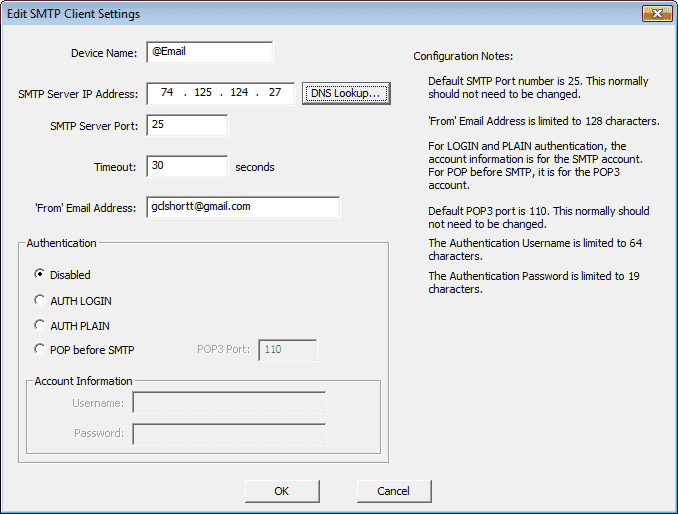 SMTP relay service – used to send mail from your organization by authenticating with the IP address(s). You can send messages to anyone inside or outside of your domain. 2. 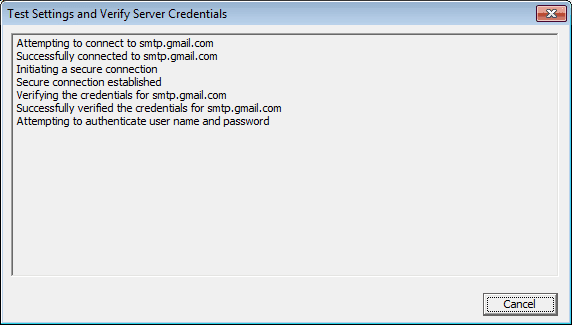 Gmail SMTP server – requires authentication with your Gmail/Google Apps account and password. Messages can be sent to anyone inside or outside of your domain. 3. Restricted Gmail SMTP server – does not require authentication, and you will be restricted to send messages to Gmail or Google Apps users only. Now start the Do-more Designer software. This is available free of charge and is a fully functional package complete with a simulator. The BRX Series PLC has an Ethernet connection on board We will ensure this is connected to the internet. Start a new project or an existing project that has a connection to the internet. 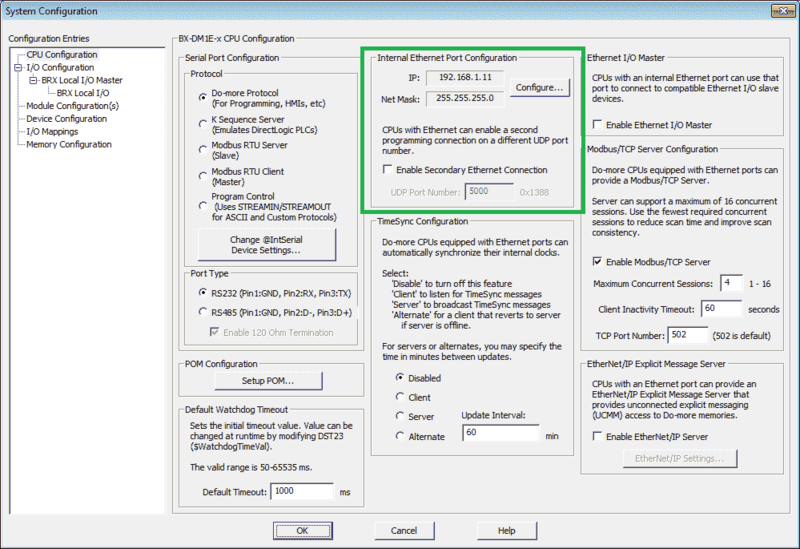 In ‘CPU Configuration’ verify the IP address and Net Mask. Hit the “Configure…” button. The gateway address is now shown. This is the address to the intranet that needs to be set. Besides the URL: enter the server address aspmx.l.google.com and then hit ‘Lookup’. 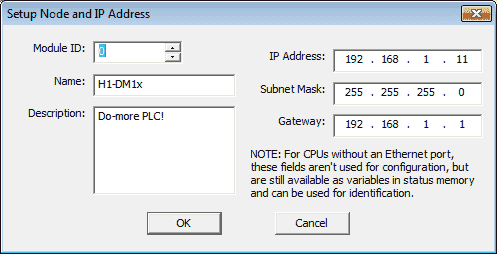 This will retrieve one of the IP addresses of the server. Then press ‘Select’ to return this address to the configuration page. 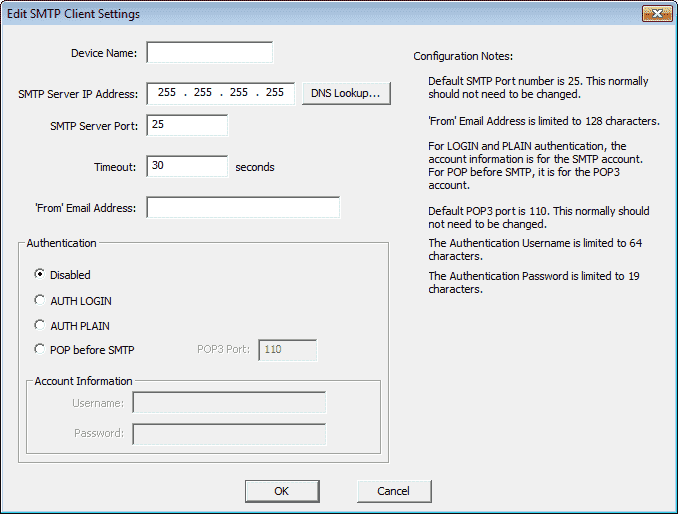 Ensure that the SMTP Server Port is set for 25. This is the default port setting. The Timeout setting can be left at 30 seconds. This is the amount of time for the PLC to wait before setting any error message. Enter your ”‘From’ Email Address” – Enter your Google Gmail account address. 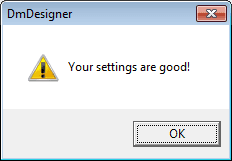 Select ‘OK’ to end the configuration. Ensure that authentication is disabled. Now that we have our email client device ‘@Email’ set up we can move onto programming the Email messages. We use the EMAIL instruction in the PLC to send the messages. We will send our message with a file attachment. Here is the instruction. Select “Automatically insert space after each term”. This will insert a space after each variable in the message. You must be specific on the location of the file and the name of the file to be sent. If the location or file name is incorrect, then a file with “Error Opening Attachment” will be sent. We will select “Delete File after EMail Sent”. This will erase the file every time the email is sent. Here is the instruction in our ladder logic. You will notice that the instruction itself has a built in one shot. This is the triangle indication of the instruction. Here is the rest of our ladder logic. This will increment V0 every second. It will also use FILELOG instruction to log V0 every second. Running the program and triggering the messages will send the Email to your google account. The email will automatically go to your spam folder. This is because authentication is turned off. In order for the email to go to your inbox and forward the message as a text (SMS) message, we need to set up a filter. Select ‘Create a new filter’ or if you already have one select the edit button beside the filter. 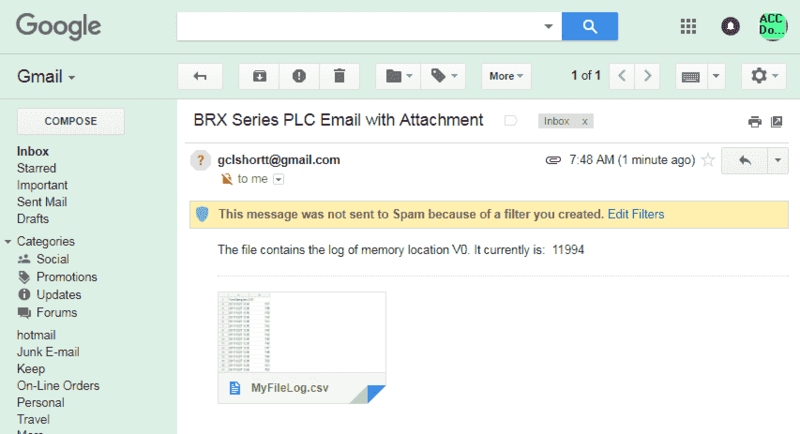 Under the subject, we will add the title “BRX Series PLC Email with Attachment”. The filter will see this email subject and trigger the actions to follow. “Never send it to Spam” selection will ensure that the email will go to your inbox. A dialogue to select forward Email to a specific account. During this process, a verification code will be sent to this address. You must enter this code for validation or respond to the Email in order for the forwarding address to work. Once we have the forwarding address in and verified, we can select Update or Save Filter. Running the program and triggering the Email instruction will be sent the email to our Gmail inbox. Opening the message we can see the attachment. 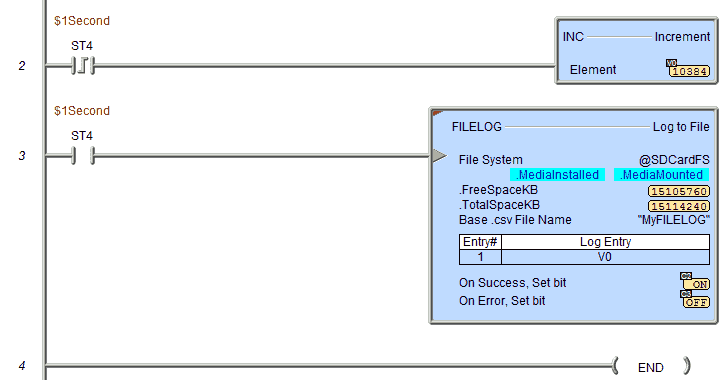 Clicking on the MyFileLog.CSV file will show you the contents of the file. You will see the date and time along with the value of register V0. In the above example, we used a restricted Gmail SMTP server. No authentication was required so we can send an email with only an internet connection to the PLC. 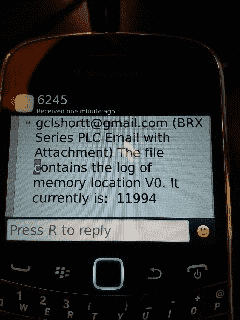 See the video below to see the BRX Series PLC Send Email and Text (SMS) Messages. Note: This must be done when you are online with the PLC. We will use our program from above and add authentication to our email instruction. 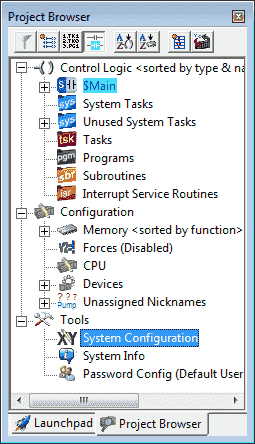 Call up the System Configuration window. Main menu | PLC | System Configuration… or select System Configuration under the Tools heading in the Project Browser. Select Configure… under the Internal Ethernet Port Configuration. 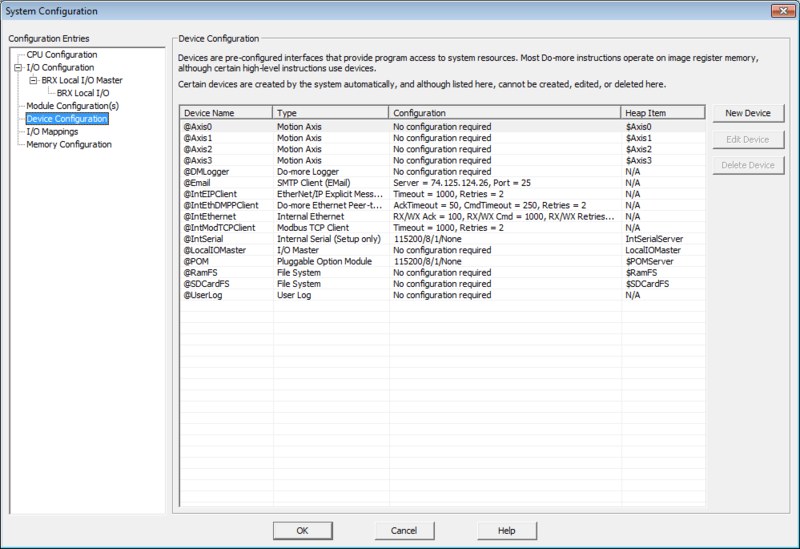 This is located on the left side under CPU Configuration. If we specify a specific IP address such as 74.125.124.27 we do not need a DNS. However, if we specify aspmx.l.google.com then we need a DNS to look up the specific IP address. We will leave all other values the same as our example above. Our Ethernet port is now set for our email communication. 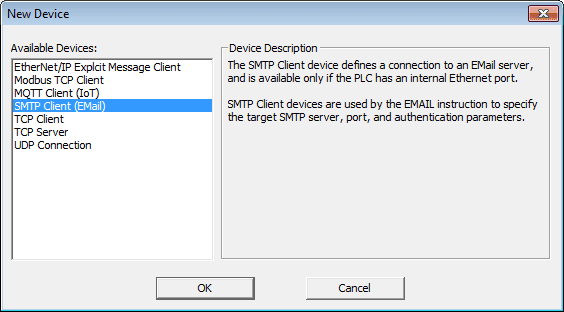 Under the Device Configuration menu in the System Configuration menu, we will create a new email (SMTP Client) device. Select New Device. 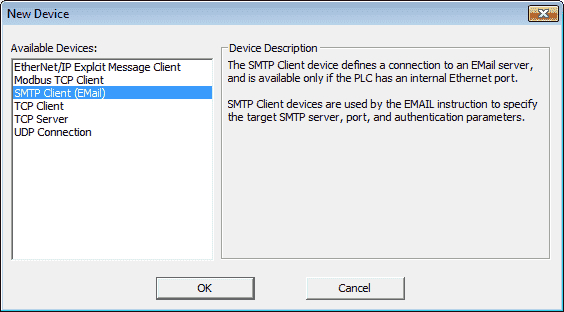 Select SMTP Client (Email) and hit OK.
Once we have specified all of the information required to communicate to the gmail server we can now test the settings. 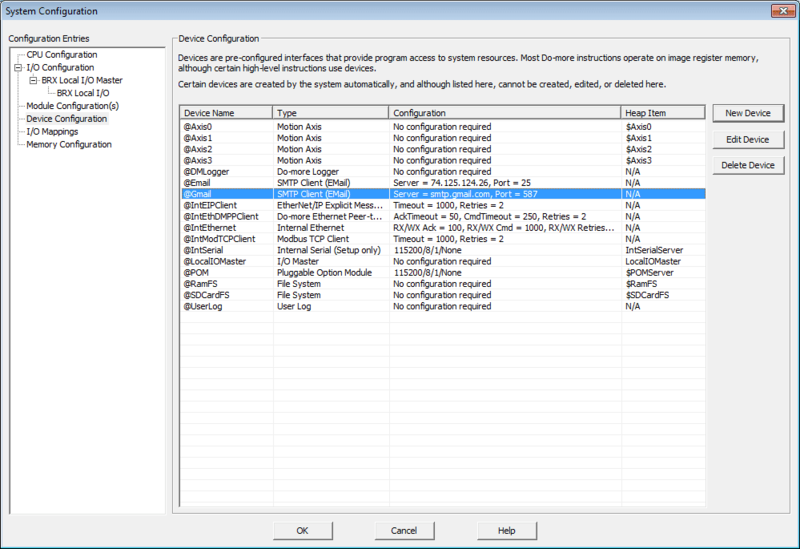 Select ‘Test settings and verify server credentials’. Our testing will now take place. If everything has been set and working we will get this confirmation. We now have our gmail device set to use in our program. We will now modify our existing EMAIL instruction. 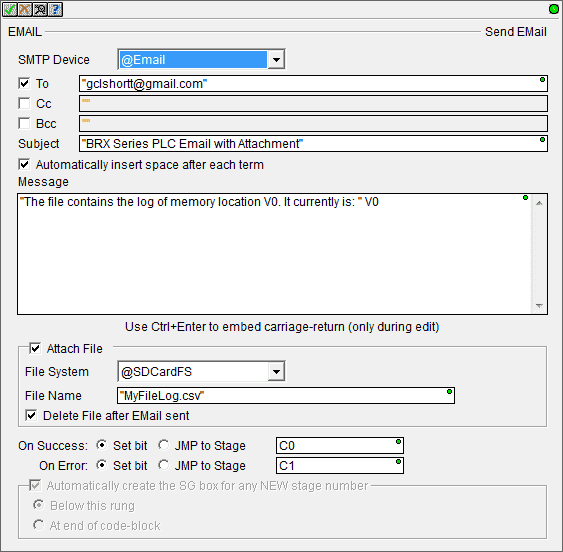 Choose the SMTP Device as @Gmail. This is the device that we have just set up. 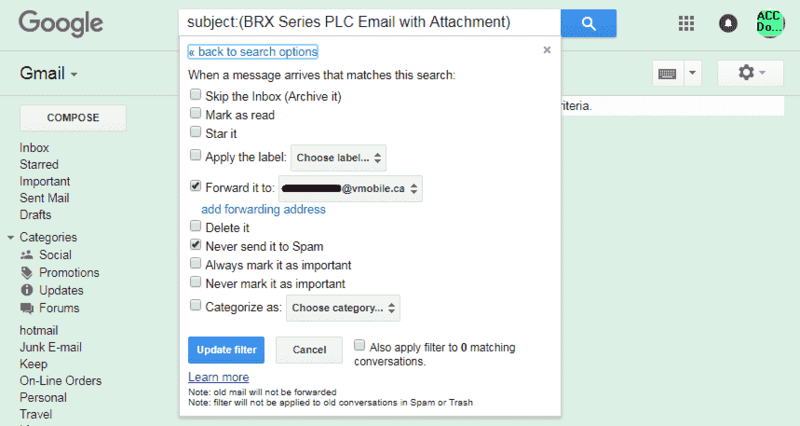 We have also changed the subject of the email to ‘BRX Series PLC Secure Email with Attachment’. Here is our completed instruction. Running the program and energizing the rung will send a secure email. Here is what the email will look like. Watch on YouTube : BRX PLC Secure Email Communication ﻿﻿﻿﻿﻿﻿﻿﻿﻿﻿﻿ If you have any questions or need further information please contact me. The BRX Ethernet port should be directly connected to your router. If you need wireless then use a point to point solution (Ubiquiti Nanostation) back to your router. 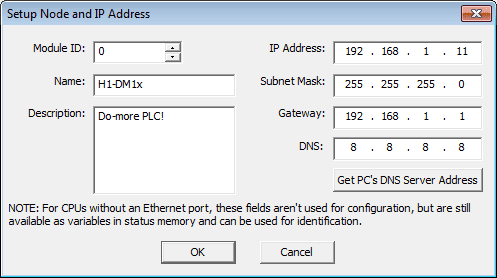 In the BRX IP Settings you will see the IP address for the internet.